Home » Buy Shimmer. 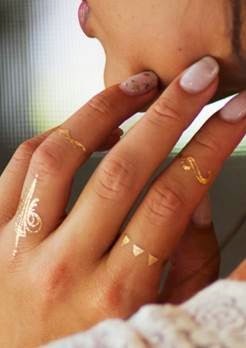 Flash Tattoos » Etsy » Hot Jewels » Printed Village » Yes, It had to happen: Shimmer Body Tattoos for $10 plus S&H and they last! Yes, It had to happen: Shimmer Body Tattoos for $10 plus S&H and they last! Shimmer Jewelry Tattoos are a creative, affordable and painless alternative to a traditional permanent tattoo. Anyone that knows me would attest to me introducing them to Flash Tattoos months ago. I still support the brand and love the designs and this is yet another, more affordable option that works well. Shimmer Jewelry Tattoos can be applied anywhere and are easily removed with Baby Oil. Each Shimmer Jewelry Tattoo package contains 50 assorted silver and gold jewelry designs that can be worn as necklaces, ankle or wrist bracelets, arm cuffs, rings and charms, or as simple stand- alone icons. Applied with water, the stunning tattoos stay intact for 4 to 6 days. Shimmer Jewelry Tattoos are available online and at select retail stores. You already know I was wearing Flash Tattoos as soon as I saw them launch at the Swimwear Show for L*Space and was adorned with them during New York Fashion Week. That being said, I did sample these at a show and they were fast and very easy to apply. As you get better with application, the "meeting" of the top beginning and end where the tattoo meets starts to look better and better, resembling real jewelry more and more. There are other companies such as Printed Village and Hot Jewels that have stunning and colorful designs as well. Etsy seems to have sellers abound, as well.